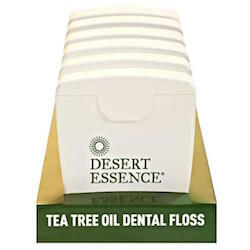 Desert Essence Dental Floss is naturally waxed with beeswax and saturated with Australian Tea Tree Oil. This easy-to-use dental floss does not tear while using, making it suitable for hard to remove food particles between your teeth. Ingredients: Naturally waxed and saturated with pure inherently antiseptic Tea Tree Oil.